Text items in my project are measured with pixels as I need it to be, but shapes - only in points, even though there are "Pixels" selected in Preferences->Units. In other project files everything's okay. Solution: Turn on the ruler via the view menu. Select it. 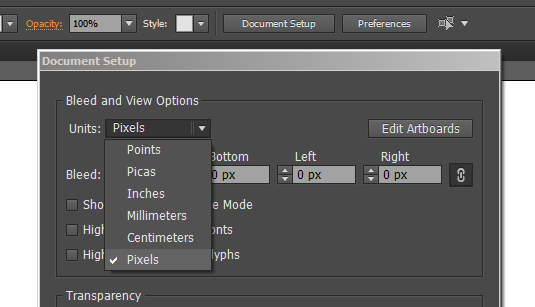 Now right click the ruler on canvas and choose pixels. Just to iterate on this - if you are seeing it in pixels (for example) and it's says in document properties it's set up as mm, just changed it to and from pixels back to mm and it'll sort itself out. This also works in Illi CS4/5/6 - where I'd get px based eps/pdf/ai assets from clients/contractors etc. Aligning 2 shapes using a side or two points in illustrator? How can I locate points on a path that are not smooth in Adobe Illustrator?